Arsenal take on Manchester United this Wednesday night, with Unai Emery preparing for his first trip to Old Trafford as Gunners boss. Arsene Wenger’s record at United’s ground was disastrous in his final decade with Arsenal, with the club failing to win a Premier League game there since all the way back in 2006. 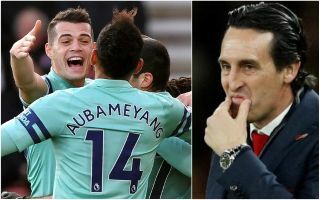 Since then, Arsenal have just the solitary FA Cup victory from 2014/15 to brag about, but Emery has the north London giants in good form this season, while United are a bit of a mess under Jose Mourinho. Against Tottenham and Bournemouth, Arsenal looked pretty good with three at the back, so there’s no reason not to continue with that against United, particularly as it gets the best out of attack-minded wing-backs Sead Kolasinac and Hector Bellerin. However, Alex Iwobi and Henrikh Mkhitaryan have left plenty to be desired of late, with Arsenal looking far better against Spurs when they were both hauled off by Emery. Replacing those two should be Aaron Ramsey in a free role behind the two strikers, with Alexandre Lacazette coming in to partner Pierre-Emerick Aubameyang. Those two front-men have been lethal for Arsenal this season and should have a field day against what seems likely to be a makeshift United defence. The Red Devils have been dodgy at the back all season long as the likes of Chris Smalling and Eric Bailly struggle to hit top form, with Mourinho even resorting to using Nemanja Matic and Scott McTominay in defence. That has rarely worked well at all, and will surely only be worse against an attack as in-form as Arsenal’s right now. Finally, it remains unclear whether or not Mesut Ozil is really injured and if he’ll be back for this game, but either way there seems little need to bring him back after two convincing wins in a row without him. If the German is available, he can be a good option on the bench.